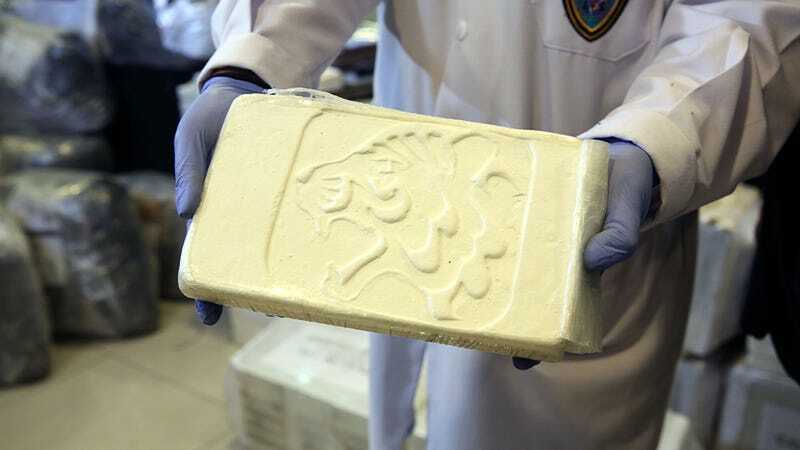 A very, very, very big brick of coke from a drug bust. Photo: Martin Mejia/AP. Cocaine, as they say, is a hell of a drug. It affects three of the neurotransmitters in our brains that make us feel fantastic—dopamine, serotonin, and norepinephrine—and tolerance for the stuff doesn’t seem to dissipate even months after quitting. (It’s also expensive and bad for you.) Today, new research published in Translational Psychiatry adds another bizarre facet to one of the world’s most popular drugs: the cocaine addicts in your life have unusual deposits of iron in their brains. Dr Karen Ersche and a team of researchers from the University of Cambridge examined the brains of 44 people with and 44 people without cocaine addictions. Those addicted to cocaine were found to have “excess iron accumulation in the globus pallidus” region of the brain, in amounts of which correlated directly to how long these 44 subjects had been using. With a greater understanding of why so much iron crosses the blood-brain barrier, the size of these deposits might eventually be used diagnostically to measure a patient’s level of addiction. Naturally, more iron in the brain means less iron elsewhere, which the study found to be the case. Iron is vital to one of the missions of red blood cells: the circulation of oxygen through the body. Less oxygen is, much like a full-blown coke problem, considered undesirable. Iron buildup of this kind is “not unusual because we see iron accumulation also in neurodegenerative disorders [like Parkinson’s or Alzheimer’s]” Ersche told Gizmodo, though the study was not able to link habitual cocaine use to an increased likelihood of developing those diseases. The presence of iron deposits in the brain is the same, but the location and mechanism by which they get there are not. So far these findings are interesting but don’t provide much by way of practical applications. The next step for Ersche and her team is to better understand and hopefully reverse iron buildup in the brains of cocaine users, and hopefully use that information to help addicts quit.